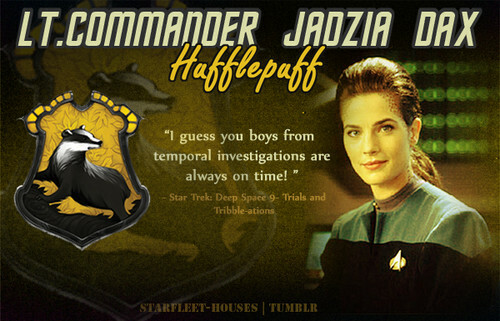 Jadzia Dax - Hufflepuff. Jadzia is a fun-loving prankster who is friendly and tolerant to nearly everyone aboard DS9. Jadzia is fiercely loyal and fights for her friends. Due to her hardworking ethics and close,strong bonds with all her co-workers put her in Hufflepuff. Wallpaper and background images in the nyota Trek: Deep Space Nine club tagged: deep space nine star trek ds9 jadzia dax terrry farrell trills trek meets hogwarts.